Hi guys, All of you know about Jio Prime benefits Every day prime members are increasing. 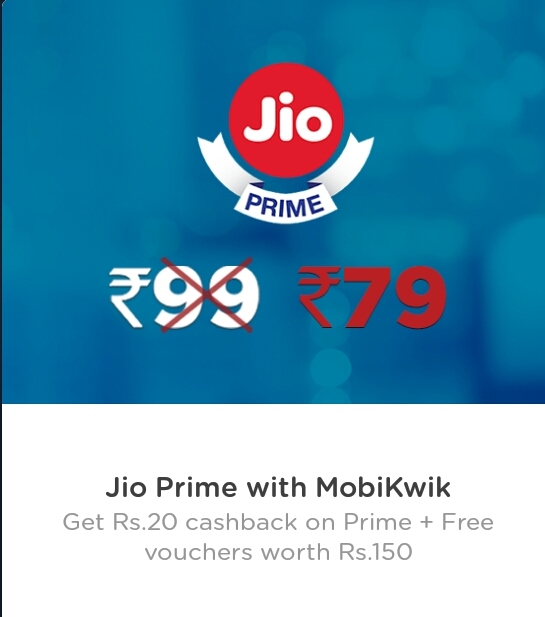 Now Here Mobikwik is offering Cash Back offer on Activating Jio Prime Membership Offer. Now Activate Jio Prime of Rs.99 & Get Rs.20 Super Cash Back on your Mobikwik Wallet. So if you not yet activated your Jio Prime Membership Offer then Activate now. So hurry up and grab this offer before expire . – Complete your Payment . – You are now become a Jio Prime Member & Cashback will be credited to wallet within 24 hours. – New to Mobikwik? Use code PRIMENEW and get flat 50 Super Cash on Jio Prime Membership Subscription. – Coupon redemption & Payment should be done on MobiKwik’s Android, Windows, iOS App or website. – The code can be redeemed only once per user. – Voucher to the users will share via sms/email within 7 days. – The offer is applicable on Jio Prime membership only. – Also Get flat Rs.150 SuperCash on bus booking. – This offer is valid only on MobiKwik’s website, Android & IOS App. – The offer is redeemable once per user.Cashback will be auto-credited to your MobiKwik wallet within 24 hours of bus ride completion.